Carlow are the first ever Joe McDonagh Cup champions after a storming second-half performance at Croke Park eased them past Westmeath. Colm Bonnar's side trailed in first-half stoppage-time but dominated from there on with goals from James Doyle and Chris Nolan elevating them to a hugely significant win. The victory means Carlow will compete in the group stage of the Leinster championship proper next season as the replacements for relegated Offaly. And their interest in this year's Championship is still very much alive with an All-Ireland preliminary quarter-final next weekend against Limerick. Westmeath, who jointly topped the McDonagh Cup table alongside Carlow, still have a big game to look forward to against Wexford next weekend. It was the teams' fourth competitive meeting this year and was a tense tussle from the off with the counties level seven times in the opening half. Carlow led by 1-12 to 0-13 at the break and took advantage of a huge turning point in the game to do so. Westmeath had looked all certain to score a goal a minute into stoppage-time when Aonghus Clarke bore down on goal but he blasted high and over. From the resulting puck-out Carlow claimed possession and a ball into their full-forward line broke kindly for Doyle to control and volley home. It meant Carlow led by two at the interval when they looked certain to trail by three. Westmeath also racked up 10 wides in the half and rued their wasteful shooting. Michael Ryan's side hit all of those wides in the first 25 minutes and trailed 0-10 to 0-07 at that stage but improved in the run up to half-time. They outscored Carlow by 0-06 to 0-02 in that period until Doyle, who hit a hat-trick when they beat Westmeath in the group stage, popped up with that goal just before the break. 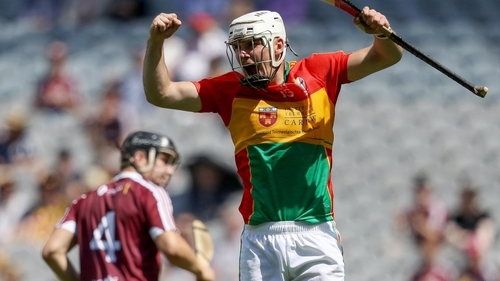 The strike clearly energised Carlow who restarted with gusto and hit 1-02 without reply to take firm control of proceedings with a 2-14 to 0-13 advantage. They never looked back after that and maintained a six or seven-point cushion for most of the second-half. Free-taker Denis Murphy punished indiscipline in the Westmeath defence with 10 converted frees on the afternoon while Chris Nolan and Paul Cody boomed over some eye catching points from play. Westmeath lost Derek McNicholas to a 66th-minute dismissal for a second yellow card though clawed back a consolation goal through Niall O'Brien right at the death. Carlow: T Tracey; A Corcoran, P Doyle, M Doyle; K McDonald (0-01), D English, R Coady; J Kavanagh, D Byrne (0-01); JM Nolan (0-03), P Coady (0-04), E Byrne (0-02); D Murphy (0-10, 0-10f), J Doyle (1-01), C Nolan (1-04). Subs: R Smithers for D Byrne 66, S Murphy for E Byrne 67, R Kelly for Kavanagh 69, J Murphy for P Coady 71, T Joyce for C Nolan 72. Westmeath: P Carroll; S Power, T Doyle, J Gilligan; L Varley, P Greville, D McNicholas (0-02, 0-01f); E Price (0-06), R Greville (0-02); N Mitchell (0-01), J Boyle, A Clarke (0-03); N O'Brien (1-01), C Doyle, A Devine (0-08, 0-08f). Subs: D Clinton (0-01) for C Doyle 39, S Clavin for Varley 39, C Boyle for J Boyle 46, B Doyle for Power 62, C Shaw for Mitchell 67.